The new way to power level your World of Warcraft characters is by instance leveling, which pretty much means all the old leveling guides are obsolete. Thankfully, there are now some good instance leveling guides available, like Dugi’s Dungeon Leveling Guide. Let’s take a closer look at the major differences between traditional WoW leveling guides and the new instance leveling guide. You can’t even use the dungeon finder tool until your toon reaches level 15, which means the first 15 levels have to be done the traditional way: through quests and experience from killing monsters. This means that your instance leveling guide will look much the same as traditional guides in the beginning, but that will all change when you reach level 16. The reason a good instance leveling guide recommends that you wait until level 16 to begin instance leveling is because you only train your new skills on the even levels. This means it is really more convenient to wait until you train your level 16 skills, and then begin instance leveling with the dungeon finder. Once you reach level 16, a good instance leveling guide will have a complete layout of all the instance quests. The easiest way to maximize the experience you gain from all of those instance runs is to complete the quests that are available for each instance. Instance quests give you more experience and better gear bonuses than any of the solo quests, so Blizzard has certainly made it worth your while to complete the instance quests. The biggest problem with completing instance quests is that you simply don’t know where to pick them up. Even the most experienced WoW players may queue for a random instance and end up somewhere they’ve never been before, especially if they’ve never used instance leveling to level a character. This is why a good list of instance quests for each dungeon is an important tool for the power leveler. 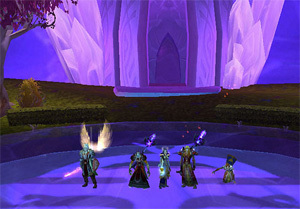 Another important feature of a good instance leveling guide is a listing of the pre-requisite quests. All characters need to complete certain quests before they are eligible for specific instance quests. Dugi’s Dungeon Leveling Guide will make sure you spend your downtime completing pre-requisite quests instead of wasting your time on other quests that have nothing to do with instance leveling. When Blizzard originally set up the classic and Burning Crusade dungeons, they didn’t plan on those instances being played very much, and so, consequently, they didn’t create maps for them. This can make it very difficult to complete the older instances, especially if you have never been in them and have no idea where you’re going. This is compounded by the fact that those older dungeons tend to be very long and full of winding passages that seem to go nowhere. Instance leveling guides like Dugi’s Dungeon Leveling guide include complete maps for all of the older instances, making a run through them pure joy and very simple.